Can unbridled passion go too far? 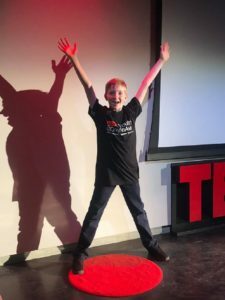 I had the privilege of attending a TEDxYouth event on May 17th, 2018. Twelve incredible youth, aged 11 to 17, presented their ideas. One of them was my 12 year old son, Caden. What a stinker to have such an opportunity! I walked out of there more than a proud papa. I had been touched by the incredible youth and the ideas they presented. And inspired by their calls to action. One spoke about setting incredibly grand goals, and going after them. A particular passion of mine about road safety was rekindled: that piece I write about from time to time about hand held versus hands free cell phone use. I shared my passion with Caden in the spirit of that TEDx evening. He had taken it as a given that talking on a cell phone while driving is a bad thing, but I explained the science of it to him anyway. That drivers talking on cell phones see (their eyes open, looking out the windshield) but fail to “process” up to 50% of what’s right there in front of them. It has something to do with how our brains work, I explained. We confidently think we can multi-task. But neuroscientists say that our brains can focus on only one thing at a time. Rather than two, parallel focuses, our brains are really flipping back and forth between the two tasks. And the flipping away from the driving task leads to “missing” things even though our eyes are wide open, looking out the windshield. We don’t realize it’s occurring. We travel thousands of kilometres, chatting on the phone here and there, with nothing bad happening. From time to time we will miss a turn off or arrive at a destination not remembering how we got there, but we chalk that up to being forgetful. Our confidence builds. As does our dependence on that cell phone. It’s Russian Roulette with a thousand chamber revolver. Sooner or later the 1 in 1,000 odds will add to rising car crash statistics. I told Caden he was only three years old when the first cell phone law in British Columbia was enacted on January 1, 2010. A law that made things worse instead of better. In both simulated and real driving environments, the use of electronic devices has been shown to result in crashes and near misses. Drivers fail to process approximately 50 per cent of the visual information in their driving environment when they are using electronic communication devices. Evidence also concludes that there is no difference between the cognitive diversion associated with hands-free and hand-held cell phone use. Legislation that bans only hand-held cell conversations conflicts with the research that has consistently found no difference in the degree of distraction between hand-held and hands-free cell conversations. As a result, these laws may not provide the expected benefits and may even generate harmful indirect impacts such as a false sense of security for those who talk on hands-free devices while driving. Caden immediately understood that concept, that banning only hand-held use would automatically send the loud and clear message that hands free was safe. Safety conscious drivers, who up until 2010 had been leaving their phones alone, were led to believe they could safely use a cell phone while driving if they simply spent the money on hands free technology. The predictable result was more, instead of less, cell phone use behind the wheel. Sure enough, I told Caden, a downward trend in car crash numbers coincidentally ended in 2010. Then a plateau. And after 2013, a steady increase. I told Caden that I’m jumping out of my skin to share this story with British Columbians. Maybe if I recorded a compelling video, like a TED talk. Maybe if I did a stunt like walk to Vancouver and back until that video got a million views. Maybe then British Columbians would demand a change in the law to ban all cell phone use while driving. By the end of the evening he was in tears. “If Daddy spends his time walking to and from Vancouver,” he worried, “who’s going to pay the mortgage?”. How’s that for dashing my TEDx inspiration! Perhaps my unbridled passion can go too far. Or should I follow through with the faint hope that the government will listen and fix what they broke in the first place?